The Healthcare Reform Debacle | Can President Trump turn defeat into a win for the American people and his presidency? President Trump was correct when he initially thought that healthcare reform should be easy for it is not as complex at it may seem. What is challenging is reigning in the extremities of both parties and getting a general consensus among our current partisan legislators in Congress who are still influenced by lobbyists and special interest groups and display an unwavering inability to compromise while maintaining an unpatriotic, steadfast commitment to party-line above the welfare of the American people. This can be best illustrated by comments from the Republican elite who recently stated no interest in working with Democrats on the issue. President Trump promised to abolish Obamacare and replace it with a less expensive, comprehensive plan that would please most Americans. However, in his rush to fulfill his campaign promise, he failed to recognize three major headwinds to the Republicans’ hastily devised partisan reform. First, President Trump didn’t fully comprehend the factions that existed within his own party: The Freedom Caucus, an unwavering group that was determined to doom a partisan Republican plan highly leveraged in their best interests and introduced by their own party’s majority leader Paul Ryan, and the moderate camp that recognized the inequities of such a sectarian plan. Second, no healthcare reform plan can be successful in the long term as long as insurance companies have the ability to determine pricing and decide whether or not to participate. Third, he didn’t realize that any partisan plan perceived to be unfair to the majority of Americans, even if legislated into law, in the long term, is doomed to failure when the pendulum swings in the opposite direction and the opposing party again takes control of all three branches of government. President Trump is correct when he states that Obamacare will implode. The latter two reasons listed above best illustrated why Obamacare is doomed. Obamacare was a poorly constructed plan, devised from good intentions, but supported primarily by one party. And, insurers, to a degree, were given the ability to determine rates and the willingness to participate in various states, which will eventually result in the collapse of this unilaterally devised and implemented legislation, unless modification are made to prevent such actions. So, how can our President turn this loss into a win for Americans and for his administration? First, President Trump must realize that to succeed in such a venture, he must fulfill his campaign promise to become the “defender of the forgotten.” To do so, he must reach out not only to Republicans, but to the Democrats and Independents in Congress as well. Second, he must create a bipartisan committee to formulate legislation that will modify healthcare in a manner that will be just, inclusive, efficient and affordable. In doing so, he may reach a bipartisan consensus that will propose legislation that is in the best collective interest of most of the constituents they represent and will survive the test of time, regardless of which party in the future gains power. Third, profit to insurers should be minimized while profit to the actual caregivers should be maximized, but realistic. And, fourth, insurance companies should have little input, while doctors’ concerns should be reasonably addressed. Insurers are responsible to their shareholders, while most physicians are responsible to their patients (although this too is changing as many band together to reduce overhead). Shortly after President Trump emerged from his meeting with insurance companies, that simply want to maximize their profits, he said he didn’t realize healthcare reform would be so difficult. Of course it is difficult when the wolves are trying to determine how they are going to divide the henhouse! Remove the wolves, lobbyists and special interest groups from the equation and the solution becomes far easier to obtain. Recently, President Trump has expressed a willingness to work with Democrats, possibly to force Republicans to accept his party’s proposed plan. If true, this would be a well-calculated move on his part to pass a modified, partisan version of a healthcare reform bill that never came to the floor for a vote. However, before Trump takes such action to simply pass partisan legislation, he should remember that during the campaign he was not supported by the Republican Party’s current leadership and many Republicans, but rather by a vast number of independent voters. President Trump mustn’t allow himself to be duped by the same party elite he promised to purge; the Republican bureaucracy that failed to support, and in many cases, opposed his candidacy. Instead, President Trump should become a true statesman and commit to work with all factions within Congress to formulate reform that is fair, comprehensive, cost effective, and attainable. If he selects this latter course of action, but fails to succeed due to congressional unwillingness to compromise, he can then attempt to appeal to the moderates on both sides of the aisle. If that should fail, President Trump can rightfully and candidly address the American people during the interim elections and legitimately ask them to elect representatives willing to compromise in order to construct and pass reform legislation that represents the best interest and welfare of our nation and citizenship. President Trump should not be surprised that our federal government is full of scoundrels, disloyal party members, and an unwillingness to compromise, for one of his main campaign objectives was to drain the swamp, which is actually more of a cesspool. And, it is difficult to fault the President for surrounding himself with trusted family members as long as they do not become contaminated by the cesspit, for Washington has become a breeding pond for graft, greed and corruption. But, when draining the swamp, President Trump must keep in mind “congressional swampland” consists of members of both parties, not just those perceived to be his Democrat rivals, and that having a different perspective should not necessarily banish one to the swamp. Also lying within the swamp are the bottom-feeding special interest groups and lobbyist who have their own personal agendas. The Romanov family of Russia sealed their fate, which led to the Bolshevik Revolution for three primary reasons. First, they lived an opulent lifestyle and were out of touch with the needs of the “common man,” even as their people and army were deprived of food and essential supplies. Second, the Romanovs thought they were invincible. Third, the Romanovs had their twisted, mad monk, Rasputin. Although President Trump lives a hard-earned lavish lifestyle, he needs to fully comprehend what Americans endure in their daily lives, what they require to survive and prosper, and how his needs differ vastly from those of the poor and middle classes. Although he and his cabinet collectively are the wealthiest administration in history, it needn’t necessarily disqualify them from representing the interests of all economic and social classes within our country, as long as his administration has the inherent ability to view the interests and needs from a multitude of perspectives, something highly suspect at the present time, but something that can only be proven or disproved over time. From my firsthand knowledge of the man, I used to know he is capable of such insight should he decide to solidify a legacy worth remembering. After suffering defeat of the healthcare reform proposal, the newly-elected president’s first major proposed legislation, President Trump has begun to realize that he is not invincible in the political arena, a lesson well learned and reminiscent of the one experienced in the late eighties when he clawed out from an abyss of his own making, and climbed from the fringe of bankruptcy and despair to reemerge as a wiser, even more successful entrepreneur. History reminds us, like the Romanov royal family, most administrations have their Rasputins. Presidents Lincoln, Jackson, my very favorite, Johnson and Bush, all had their share of disloyal and disgruntled, self-serving egomaniacs. Once President Trump recognizes his, and either naturalizes or “drains them from the swamp,” his administration and party may become far more centrist and much more willing to compromise. Perhaps he will then fulfill his pledge to be his own man and cross party lines to make decisions that will elevate the forgotten and very well validate and embellish his presidency. Our president is the leader of the free world and the most powerful man in the world and may be revered as such if he chooses to assert his authority and presence in a positive manner. Yes, President Trump was correct when he stated during his campaign that healthcare reform was going to be “so easy.” But to facilitate change with ease, he must realize it is essential that any future or revised healthcare plan must meet the needs of his constituents, that dissension to serious but fair reforms within the extreme of his own party should, at times, be ignored and circumvented, and that healthcare reform must be nonpartisan, and not profit-driven. President Washington thought of his constituents as his children and had their best interests in mind when governing his newly formed republic. If President Trump envisions his constituents in the same manner, considering how well his children have turned out and how he inscrutably overlooks their welfare, he should be able to construct a plan that he would proudly and wholeheartedly present to his extended family, the American public. Most Americans really don’t care which party is in control, if their governance has their best interest at heart and that pain and hardship is fairly distributed. However, reassurance will not be provided if healthcare reform legislation fails to provide just, inclusive, efficient, and affordable coverage. President Trump is correct when he says healthcare, tax, immigration and other reforms must be interwoven to succeed. But, support will not be universal or broad if funding is taken from those who can least afford such modifications to pay for relief to those who can most afford forthcoming structural change. Roughly 3.2 trillion of our total GNP is spent on healthcare in America. In 1975, healthcare expenditures accounted for 8.4% of America’s GNP. Forty years later, in 2015, the health spending report from the centers for Medicare and Medicaid wrote that, “the total cost of healthcare in the United States is 17.8 percent of our GNP.” If action is not taken to drastically reduce this trend, by the year 2020, this percentage could very well approach 25% of the value of all goods and services produced in our country. Spiraling healthcare costs are the concern of every American, because they are detrimental to the individual who has less disposable income to purchase goods and services and to invest in education and savings. They are damaging to businesses, which contribute to employer sponsored health plans or suffer reductions in productivity as a result of illness-related absenteeism incurred by those not covered. And, it is harmful to taxpayer-funded government budgets, which fund employee health plans and pay the healthcare costs of those on Medicare and Medicaid. Without realistic healthcare reform, these mounting costs will continue to be a drag on the economy, reduce our economic competitiveness, and divert monies from other crucial programs in dire need of funding. Congress should act in a bipartisan manner and streamline healthcare costs by combining programs, judiciously reducing fraud, and implementing major reforms. Sadly, it is highly unlikely that our representatives will implement modifications that will be in their constituent’s best interests because greed, congressional obstructionists, and ideological differences allow our congressional representatives to be far more focused on the interests of lobbyists and their employers, their respective political parties, and their own financial well-being, rather than on the interests and the health of those they were elected to protect and serve. To fully understand why our insurance system is so costly and why most forms of insurance are inflated, one must go back to the second half of the Twentieth Century when several of our largest insurance companies were mutual companies, and their primary obligation was to the insured. When these companies converted to stock companies, which provided windfall profits to top executives, their primary responsibility shifted to the stockholder, thus adding an additional layer of costs to be paid in the form of dividends. Around the same time, managed care corporations began to emerge. Expected to substantially lower costs, they instead shifted payment from caregivers to administrators, capital improvements and stockholders, thus adding additional layers of unnecessary outlays. To these layers of unnecessary distributions, we must add the billions spent on multiple insurance forms, and the hundreds of billions lost to fraud, unnecessary procedures, unwarranted administrative costs, and unjustified hospital admissions. It is estimated that these five alone may account for nearly 30% of all healthcare expenditures. We have transformed healthcare from an altruistic service to a greedy, profit-driven industry. And, in doing so, we have created a windfall for the insurance, managed care and pharmaceutical companies, while squeezing profit margins for physicians and caregivers who have spent hundreds of thousands of dollars on education, while delaying for nearly a decade their entrance into the workforce. As for the insured, we have created insurmountable premium and patient-care cost burdens. As part of Lyndon Johnson’s “Great Society” in 1965, Social Security amendments resulted in the creation of two health programs, Medicare for the elderly and Medicaid for the poor. Under President Obama in 2011, a universal health plan was passed. Many in Congress opposed passage of our new universal care program, commonly referred to as “Obamacare” because they considered it unaffordable, an intrusion into the private domain, and a prescription for disaster. If anyone should know a prescription for disaster it would be the veteran members of Congress, who allowed drug companies to formulate our current “Part D” Medicare drug program with no safeguard for the government to have the ability to negotiate for competitive pricing. To summarize our present dilemma, healthcare costs are crippling our economy, and our representatives have done nothing to strengthen the two programs under our healthcare umbrella, but have, instead, further compromised their integrity by adding a third option to further weaken the system. Although credit must be given to President Obama for addressing the need and getting a universal plan in place, the plan, although comprehensive, is awkward, cumbersome, unnecessary, and unsustainable. Before I recommend suggestions to improve healthcare, I want the reader to understand that I am a proponent of free enterprise and sincerely believe that capitalism is the best path to prosperity. That being said, I do not agree with unfettered capitalism, and I believe that there are several social programs such as Social Security, Medicare, and Medicaid that are not profit driven and benefit Americans. But, they must be refined and managed correctly, to benefit our great nation. My recommended healthcare reforms are quite simple. Combine our three current forms of government healthcare assistance into one single payer, economically sound, cost effective, universal plan that covers all Americans, uses one standard form, adequately addresses fraud, and penalizes those who refuse to make lifestyle changes that enhance their health and reduces unnecessary expenditures. This well-constructed plan must be designed to substantially reduce overall expenditures, increase doctor participation, address patient needs, and provide equitable payment to the actual providers of care, rather than to administrators and stockholders. Instead of increasing payments to physicians, our current system continually reduces fees paid to Medicare and Medicaid providers, which discourages physicians from participating in these programs. In many cases, these substandard payments drive physicians from their chosen profession, which may likely lead to massive shortages of American doctors, who will be replaced by physicians from foreign countries. Therefore, the plan must contain provisions for educational subsidies that establish safeguards that prevent physician shortages from occurring as experienced by countries with comparable plans. To avoid shortages of qualified caregivers, Obamacare should be incrementally replaced by this single payer system, thus allowing time for additional doctors, nurse practitioners, and healthcare technicians to be educated and properly trained. For example, fifty-five to sixty-five-year-old Americans would be the first group to transition into the plan, for their removal from the workforce will reduce unemployment and help the FED restore wage growth and a degree of inflation back into our economy, which will also benefit retirees by raising interest rates. Five years later, those age fifty to fifty-five will be admitted. This slow transition will take place until all members of the workforce and their respective families are offered the opportunity to participate in the plan and Obamacare is dissolved. Those currently sixty-five years and older would not see any changes or additional cost for their current program. Although participation will be optional, there will be a permanent penalty fee added to the annual premium cost for each year an eligible participant either fails to enroll or opts out. If one opts out for ten years and the penalty is set at three percent, the annual cost for the participant will be thirty percent higher each year for the remainder of the time the participant is enrolled in the plan. My choice for such a single payer plan is Medicare. Currently, most analysts estimate that less than three percent of total expenditures in the program are administratively related. To understand why Americans should have one universal plan we need only to consider Medicare’s prescription “Part D” coverage. Each insurer has a different plan, different costs, and different drug coverage. This program would be far more cost effective if every insurer was required to offer the same plan, price structure, and coverage, with government negotiation of competitive drug pricing. The “Part D” debacle illustrates that profit-driven multiple healthcare options are confusing, unfair, and not cost effective. Unreasonable medical costs have made it nearly impossible for all Americans to pursue our constitutionally guaranteed rights to “life, liberty, and the pursuit of happiness” because we are often unable to seek adequate treatment, face economic ruin due to catastrophic illness, or forced to choose between nourishment and life sustaining prescriptive medications. In the past, America rightly provided a safety health net to protect our aging population. We failed to provide the same for our youth, who will be our new wave of workers, and leaders who will determine the future of our great nation, and for the middle aged men and women who provide and consume the majority of goods and services that drive our economy. Surely the quality of healthcare provided to one generation should be available to all, especially when younger generations have fewer chronic illnesses and diseases and, therefore can subsidize and lower the overall costs of a universal program. If Medicare is a sound healthcare system for aging Americans, than it should be made accessible to all Americans. The Senate attempted to lower Medicare eligibility to 55 in 2009, but was opposed by Senator Lieberman from the great insurance state of Connecticut who said he would vote against such a proposal. If this bill had passed, it might have opened the door at the time for Medicare enrollment to all Americans. It is not too late to incorporate Obamacare and Medicaid into Medicare with premium assistance to eligible individuals and families. All Americans would be allowed to participate and would be covered regardless of pre-existing conditions, and all medical providers would be required to accept assignment. The result would be a one payer system that could be streamlined and made far more efficient, far less fraudulent, much more effective, much simpler, and unequivocally less costly. I believe it is possible to reduce healthcare costs by 45-50% under such a system. Of course the private business sector is not about to let 80% of healthcare revert to a non-profit single payer system without a fight. Insurers would have to succumb to the realization they would receive only a portion of the pie by being limited to providing optional supplemental and prescriptive insurance, which would still give them 100% of both markets. And, HMOs and PPOs could be prosperous if their business model was converted from reducing medical costs, to becoming the overseers of fraudulent activity, receiving a percentage of all deceptive activity. 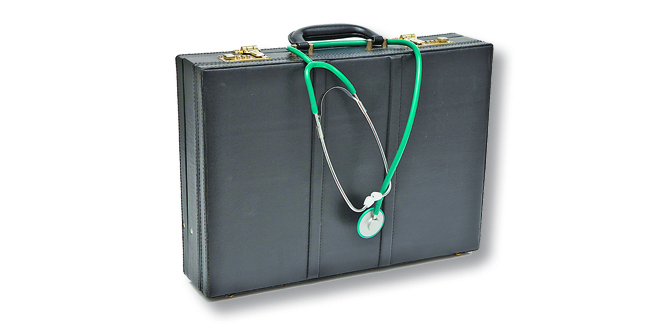 It is estimated that there is currently over 60 billion annually in Medicare fraud. If Medicare insures approximately 15% of our population, overall fraud in a one payer system could potentially exceed 400 billion dollars annually in an expanded program, thus providing a function and revenue source for the managed care industry. Americans should endorse and embrace such a concept, for we are a nation that believes in equality, and because we share one common inevitable fate; we age. It is rational to have one universal system to provide care continuity by covering every American through this aging process. Group insurance coverage through work is normally cheaper because it spreads risk throughout each age bracket. Such a streamlined national Medicare group policy would do the same, but with far lower costs per person. Younger generations may find this unfair and balk, because they have fewer chronic ailments. They must realize they too will age and incur many of the same ailments as our retirees. When they do, they will look toward subsequent generations for support. The majority of America’s city and town tax revenues are earmarked for public education. Taxpayers support this allocation, because they realize it is the civic responsibility of every American to ensure the next generation is well educated and able to become contributing members of society. It is fair to ask the youngest wage earners to support universal healthcare because our aging generations continue to support education funding through property taxes in the communities in which they live long after their children have since left the “nest.” If seniors can pay for the education of the generations to follow, the largest budgeted expenditure for most American communities, why is it not the responsibility of younger generations to help subsidize the costs of the aging generation? If this is not a mutually agreeable arrangement for subsequent generations, perhaps the property taxes of couples without children and those who’s children have completed public education, should be directed to subsidize their healthcare rather than education. To further substantially reduce premium costs for most Americans, our efforts to make lifestyle changes should be rewarded. Premium credits should be given to Americans who do not use recreational drugs, are not addicted to alcohol, are non-smokers and are not chronically obese, because the top 5% of the population with chronic conditions account for nearly 50% of all health related expenses. And, all schools should become proactive in the effort to eliminate obesity by introducing health classes into their curriculum, expanding existing gym classes to include more cardiovascular activity, and introducing after school intramural sport programs for those students not involved in competitive interscholastic sports. Every American should want our general population to be healthy, and every business should want their present and future workforce to be fit, for a healthy worker is generally a happy worker, and therefore, far more likely to be a productive worker. By pooling and simplifying healthcare coverage and lowering expenses, we will reduce premium costs for every American regardless of age, and in doing so reduce expenditures for both the private and public sectors of our economy. A one payer system will increase our nation’s competitiveness; enhance our chances of eliminating deficits, reduce our country’s debt, and minimize the future risks of hyper inflation and rapidly accelerating interest rates. However, for such a plan to be constructed and passed into law, centrist will have to be the guiding light to bipartisan approval and public acceptance.